Series LVC500 electronic level controls should be used whenever a liquid level needs to be maintained, such as pumping down an industrial sump, or indicated, such as a holding tank high level alarm. A system consists of three components; 1) Cut-to-length threaded electrode rods. 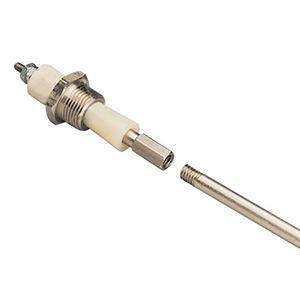 2) Single or multi-electrode holder. 3) Remote electronic module(s). The LVC500 Series operates on a simple conductance principle whereby a small electrical current is passed through the conductive liquid between two electrodes or an electrode and metallic tank wall. For those applications requiring a separate start and stop point, a single control module, plus two electrodes and tank reference are required. When several applications or levels are necessary within a single tank, an electrode is needed for each level (plus tank reference), plus a multi-electrode holder and a control module for each differential or single level application. Always treat hazardous areas with respect! If the electrodes or float switch is located in a hazardous area an intrinsically safe control module must be used. Intrinsically safe controls must be installed by experienced personnel familiar with intrinsic safety wiring, and installation must be in accordance with the National Electrical Code (NEC). The control must be mounted in a non-hazardous location with the wiring to the level probes or float switch going into the hazardous atmosphere. Intrinsically safe wiring must be separated from non-intrinsically safe wiring, and the length of your 14 or 16 gage copper wire must not exceed the specifications listed in the current installation manual. Consult your local electrical code inspector for further details. Inverse normally used for pump up or low level applications. For 240 Vac operations, add suffix "-240Vac" to model number, add $40 to price.